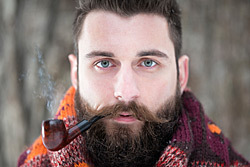 It takes a brave person to smoke a pipe outside when it’s below zero. Or is that a foolish person? I don’t know. Whether brave or foolish, and sometimes they’re one and the same, that person is me. I smoke outside. My wife doesn’t smoke and we have our grandkids out here often so I respect that and don’t smoke in the house . During spring, summer and fall it’s not a problem but winter is another matter altogether. In Minnesota, winter is a force to be reckoned with. Last winter we had more than forty days when the temperature dipped below zero. We cannot do or plan anything in winter without considering the weather. If we do, we’re courting disaster. Storms can happen with little warning, whipping into a blizzard with white out conditions within an hour. On Halloween day 1991, the temperature rose to over 50 degrees during the early afternoon and by time the day was done we had over 30 inches of snow on the ground. It can make pipe smoking outside interesting to say the least. In winter most people carry survival kits in their cars and trucks. Driving on snow and ice provides plenty of opportunities to spin out and wind up twenty feet in the ditch. And if you’re on an isolated road, you could be in trouble. A survival kit usually includes candles, matches, a small metal can for melting water, protein bars, a heavy duty flashlight with fresh batteries and a sleeping bag. For those of you who live in warm climates, this is no joke. A couple of hours in below zero weather and you can freeze to death. It happens a few times here every year. It’s nice that most of us carry cell phones nowadays. A few years ago a woman went in the ditch and was tracked by her cell phone signal. They found her right before the battery died. 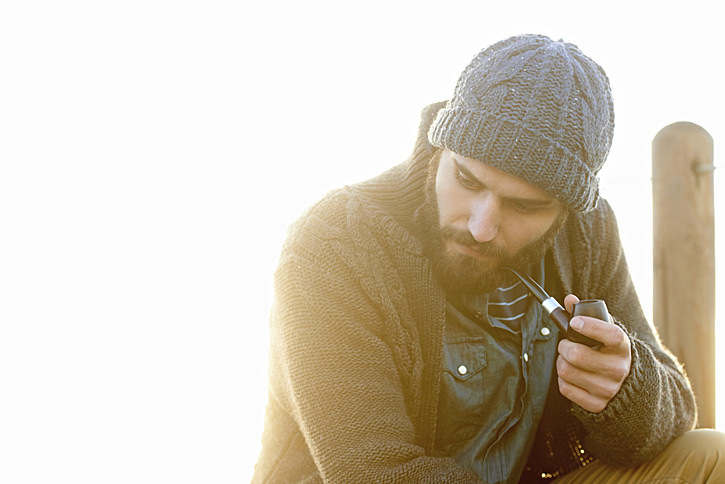 Of course no survival kit would be complete without a pipe and tobacco. Unfortunately the moisture in the tobacco would freeze solid in no time if I leave it in my car. So it’s kept in a nice warm spot inside my jacket, ready when I want it. Every morning at about 6:30 a.m., I take my dog Sophie out for a one mile walk. She’s a Malamute Husky cross with blue/white eyes and weighs close to one hundred pounds. She needs her exercise so we go unless the weather is life threatening. That’s a good time for me to smoke my pipe. It’s a nice relaxing time that helps me wake up and having my pipe at that peaceful time of the morning is great. We live about 3½ miles from town on the North side of a lake. The land around us is beautiful and filled with wildlife so our walks are almost always quiet and enjoyable. Unless Sophie sees something she wants to chase. Then I have to worry about my arms being torn off. Sophie is a force to be reckoned with also. It takes us about twenty five minutes to do our mile and I have a couple of small pipes that work perfectly for that. The only drawback to smoking on a walk or, ‘lunting’ as it’s called is the wind. Out here among the cornfields and lakes the wind is almost always present. 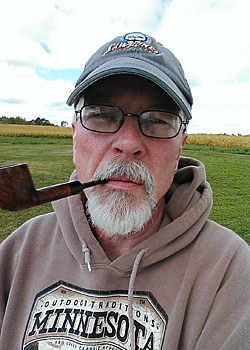 I use a wind cap on my pipe which works pretty well but if I have to relight in the wind it can be a challenge. There are plenty of people who work outside in winter, either for a job or around the house. Staying active in winter gives me the opportunity to smoke and it’s also good for my waistline which seems to have expanded over time. Maybe it’s age, and maybe I just need to be more active. We have a tendency to want to stay inside and eat all winter and with the Holidays not too far away I’ll be better off smoking on a walk than grazing in the fridge. There are a lot of good cooks in my family as I imagine there are in most families so I need to be careful. Moderation in everything I guess. The signs are all around us. The leaves on the trees have mostly fallen, the air is getting cold in the mornings and the daytime temps have been in the 40’s and 50’s. And there was ice on the ponds in my area this morning. It’s coming, but I’m ready. I’ve planned ahead. I have sectioned off a space about 10 feet by 5 feet with plastic tarps in my garage and if I turn on my small electric heater it gets warm enough to sit out there and smoke fairly comfortably. I can use my laptop to write or do a little work on an estate pipe while smoking there. It’s not a "mancave" by any means but it works for me. I have heard that some people use small ice fishing houses with heaters as a smoking shack and I can see that working too. In winter our lakes freeze solid enough to drive on. That’s when the ice fishing begins. A small portable ice fishing house with a heater gets warm enough to sit inside in a tee shirt and smoke your pipe. It takes a little work and planning but if you really want to smoke that new tobacco you just got then it’s worth it. Recently I’ve taken a liking to Latakia and it’s great to smoke a good Balkan in the cold air. It reminds me of campfires. The fresh clean air is great for the smoky flavor. This morning it was absolutely beautiful outside. The temperature was 27 degrees F., there was almost no wind and the sky was turning pink as Sophie and I started out. I lit up my Balkan Supreme and didn’t need a wind cap for my pipe. The cold air just makes that Latakia taste so good. Sophie sniffed along the ground and I listened to the rooster crow from a nearby farm as geese flew overhead. The smoke from my pipe hung in the air and slowly drifted away. I had to work today, another nine hours on my feet, but that seemed a thousand miles away as I smoked my pipe in the quiet peacefulness of a cold morning in Minnesota. After that, it just had to be a good day. Marshall Lee Armstrong enjoys camping, fly fishing, kayaking, painting, drumming and writing. He has published two books of poetry and writes a blog called “The Window", which includes a section called "SMOKIN‘" where he writes about cigars and pipe smoking. He is 58-years old, and has worked as a Rock Band Drummer, Electroplater, Chemical Process Technician, and Circuitry Manufacturing Supervisor. He is currently a Medical Lab Technician. He started smoking pipes in 1980. Jack London comes to mind, bringing in the dogs to help stay warm, walking to the mailbox becomes a balancing act between life and death, hands freezing to a shovel. Being from the South, I can only imagine a place like that. Winter to me, means I have to wear socks, and if it gets really bad, I go buy me a cheap coat to wear for a couple of weeks. I enjoyed reading this, and I respect all of you folks that live up in those uninhabitable regions of the world. But, I’d just prefer to read about snow and cold than experience it. Brrrr, I’m cold just reading this. As a pipe smoking Canadian from Saskatchewan our winters are very similar to the winter in Minnesota and while reading I knew exactly what your were talking about. 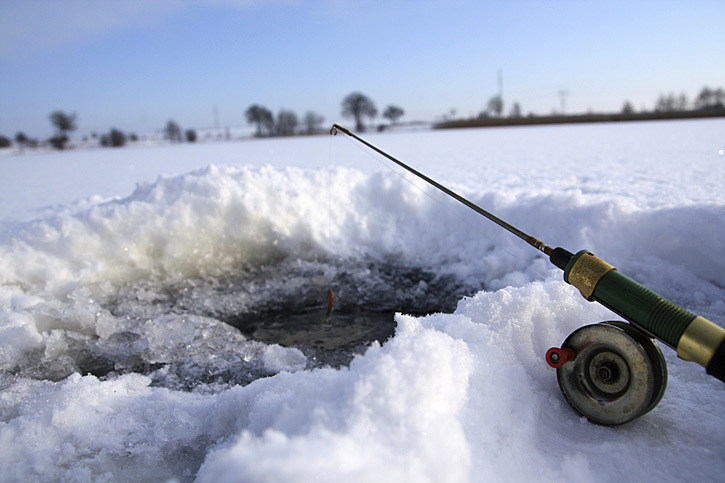 While there is nothing wrong with coming from a warmer climate folks from southern states will next understand ice fishing, neck deep snow, and winters like us northerners. Smoking a pipe takes on a whole new set of hurtles when smoking in winter. Great read and well done. YUP I feel ya right next door to you in wis last winter was a b#@$tch but kept smoking all the way thru it !! Happy Pipeing ! cosmicfolklore, great comment, “Winter to me, means I have to wear socks” You folks from the South really need to come visit us in February. Chalk it up as a learning experiance! blueeyedogre and pjm03fatboy, you guys know what I mean. Especially when you’re eyelashes start freezing together! Good to meet you all. Thanks for the comments. What a great debut article. I can relate to most of it, having grown up in West Michigan, cut my teeth on pipesmoking in Chicago, and now living in west Montana. I think the key is to keep moving, which obviously has other benefits, too. Best part about piping in winter is you don’t have to worry about fire. As soon as we have some good snow on the ground I’ll be able to wander aimlessly through the bush while puffing away without worry. I just barley started smoking pipes but I know it gets cold in the north, coming from Wyoming. I’m hoping it’ll be a good winter to start off smoking (: cheers there buds! Great article! Coming from Sweden I really get what you mean. I love taking a walk during winter while enjoying my pipe. Last winter the temperature dropped to just below -17 and I just had to take a walk and listen to how eerily quiet everything was and just enjoying the solitude and my pipe. Last winters best memory. Winter’s getting going in Dubai now. This means a decent 25C to 32C during the day, time for camping in the desert, days on the beach, evenings spent outside enjoying drinks and food. If it gets really bad, in February I might need to bring a jacket with me if we sit outisde at night! Enjoyed the article. Spent 3 years in Alaska so I know the challenges of smoking in winter. The images of quiet walks in the snow are still quite vivid to me. Thanks again for the article. Redstar, Ha, Ha. I would like to spend a winter in Dubai just to see what it’s like but I wouldn’t want your summers, way too hot! slightlywittynickname, Isn’t the quiet amazing in winter? The snow is so insulating. I love winter! “Cheers!” jdjacobsen1, Thanks for the comment. I enjoyed reading that article, thanks! I’m from Scotland and a lot of that rings true here as well, especially up in the highlands. When it’s bad you need to be prepared! I’m a cigar smoker that has just started along the path of the pipe (I’ve not even made my first forum post here yet! )so it will be interesting to see if pipes are better or worse than cigars in bad weather. “Up the cold country!” It’s 23 degrees F. here tonight and will drop into the teens. Hey styler, any jobs in Scotland? I’d love to come there someday. Thanks easterntravler, for the comment. Thanks to everyone for enjoying my first article here. Stay tuned, more to come! Plenty of jobs in Aberdeen where I am, we’ve got a good few years of oil left! As a fellow Northerner, I empathize completely–winter is a trial, but frigid air surely does add a layer of flavor clarification to a bowl. Thanks for the article Butch. It makes me recall my early teaching career in Northern Alberta. Couldn’t smoke in apartment so I’d bundle up and go for a walk with my pipe. Those January evenings were sometimes as cold as -25C. Something to be said for blissful ignorance; knowing what I know about pipe dynamics I’d be worried to do that now. But those were some of my best walks; bright green and red northern lights, the sound of snow crust ‘clinking’ in the colder night air, and the stillness and quiet of the world around me. Made my pipe all the more enjoyable. Last winter we had more than 40 days when the temp dipped below zero F. And somedays it never got above zero. Makes smoking outside interesting that’s for sure! I live in Minnesota as well, and you are right about the winter weather. I have setup a space in my garage to smoke my pipe in the winter if the weather is really cold. Otherwise if it’s nice 20F or above I’ll be on the patio smoking my pipe.